It started a month ago. The first bout was more annoying than debilitating: headachey, weak, not sleeping well. In other words, and let’s be honest, sick enough to whine but not really compromised enough to call in to work. Unfortunately, this proved to be nothing more than the… forgive the term… dry run. What seemed like low-grade nausea by last Friday Morning turned into excruciating stomach pain by the evening, and I spent the next five days basically tethered to my oubliette. I couldn’t sleep, could barely eat, and I spent a couple of long afternoons drafting tentative agreements with whatever foul deity was in a position to relieve my agony in exchange for my soul. But you know what I can’t stand, even more than being sick? Using my chicken broth. Especially for something so pedestrian as actual chicken soup. I don’t know that there is another pantry staple in my world so that I am similarly parsimonious about its casual usage. I’ll shake my absurdly overpriced (but awesome) Viking Smoked Sea Salt on a salad like croutons. Saffron in homemade mayonnaise is mandatory. And I assume if I ever have the financial resources to buy a fresh white truffle every year, I’ll slather slices of it on scrambled eggs. 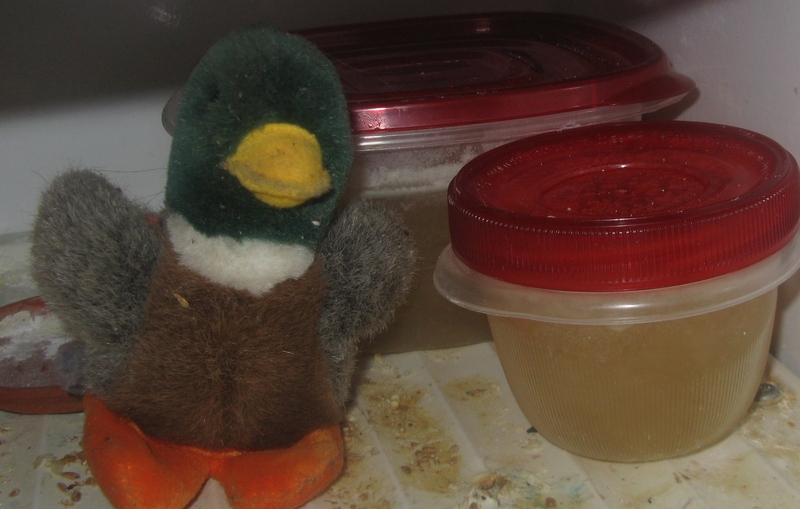 STILL be the homemade chicken stock that sits in the back of my freezer guarded by stuffed animals. Nonetheless, rules are rules. And if I get to pull the “I can eat all the ice cream I want because I had to see the dentist under non-cleaning circumstances,” I have to abide by the “If you are sick and the month has an ‘r’, you make yourself some chicken soup. So since I already committed to the stuff, I recognized that the soup would have to be… perfect. Clear but slightly thick. Veggies that added depth of flavor but not overcooked bitterness. Succulent chicken. Garlicky as all hell. And it had to taste like childhood. The sort of soup my five year old self would have run through a snowstorm and a pack of feral dogs just to sample. This means dumplings. To save some self respect at using four cups of my broth, I forced myself to stuff them with roasted garlic and herbs. I made this soup twice, and it wound up being the perfect soup for both occasions. It’s the kind of soup that’s therapeutic to cook, and tastes good enough so that if you’re not at death’s door, you can truly enjoy it. Enjoy with a loaf of homemade ciabatta that Jeff really didn’t feel like making. 8 ounces of cooked chicken – chopped up. Step one, roast the garlic: heat oven to 400 and remove the outer papers. Drizzle garlic with olive oil and place it in a small shallow pan. Roast for 30-40 minutes or until the cloves are are very soft or until your apartment smells like it could ward off vampires. (You might want to flip the head after 20 minutes or so. Step two, dumplings. Heat the 1/2 cup of broth in a saucepan, then add the simmering broth to the flour, stirring to combine, along with the butter. Add egg, one at a time, beating thoroughly until combined. Repeat with the other egg. 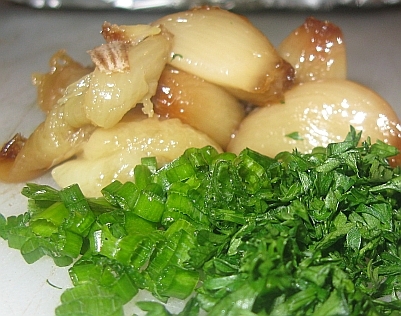 “Harvest:” your roasted garlic, and add this to the mixture along with the herbs. You may need to add another tablespoon or two of flour, just to keep the dough firm. It should be sticky but not wet. Make the soup: Heat a pat of butter in your soup vessel and add the veggies, along with a pinch of salt and cook until translucent. Add the broth and bring to a boil. Boil for a minute, reduce to a simmer, and add the chicken. Cook for a minute or two until the meat is warm. Reduce the heat to a simmer, and the dumplings to the mixture, either a spoonful at a time, or piped out of a plastic bag. Allow the dumplings to cook for a moment. Bonus: the excess starch will thicken the soup a bit. This entry was posted in Uncategorized and tagged chicken, dumplings, recipe, soup by Jeff. Bookmark the permalink. jeff, i hope you are feeling better. your illness sounds AWFUL. but this soup…. divine. i don’t have all the ingredients but i seriously could use something like this tonight for my dinner. i won’t tell you all the things i’ll be omitting & adding tho… i’d hate for us to not be friends cus of it. Hope you are on the mend, Jeff. 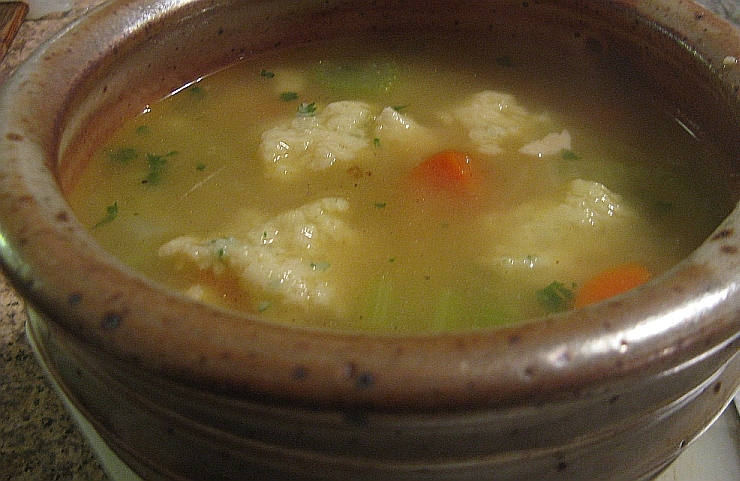 This soup with dumplings sounds like just the ticket for this darn cold snap we’re having. IE – It’s been horrible, hasn’t it? The wind has been the worst part. Fortunately, the weather tacitly gives us permission to make whatever we want in the kitchen! This looks lovely. And canned broth is never acceptable when you’re taking the time to make homemade chicken soup. MMM… yes. Dumplings. I’ve had this crazy hankering for dumplings for the past two weeks. I must make this happen. Jen – My thoughts exactly. Homemade broth is key. Thanks for visiting! David – Submit to the dumpling urge. Katarina – Thank you, as always, for your kindness and empathy. It was a bit embarrasing to come out and admit that it was actually food poisioning, but now that it’s passed, it may be funny to laugh about. I’m excited to read about your cookies!